Choose a page number to visit the recommended websites for the words in this book. Go on an adventure with Stephen Seagull. See if you can tell the time on these clocks. See a collection of aircraft at the Royal Air Force Museum in the UK. 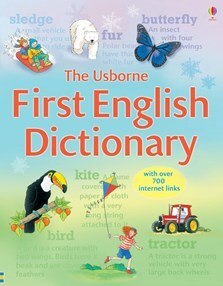 Children will enjoy learning to use a dictionary with this lively book, featuring over 2,500 carefully chosen words and definitions, accompanied by humorous illustrations that help demonstrate the meaning of the words. Includes spelling tips, writing ideas and example sentences, as well as an alphabet sequence on each page to help children find their way around the dictionary. With over 700 internet links to recommended websites with fun activities, further information and animations. Very good book for children, useful in school to learn english words.